Do you have a lot of files and need a good way to present it to your archive users / visitors? A good way to do this with MediaFiler is to use metadata to set up a menu to sort the data! Have a look at what we did for National Tourist Routes in Norway. Their images are from several locations along tourist routes all over Norway, and they wanted the locations to be more visible and accessible to the visitors of their archives. We set up a two-layered menu structure, with tourist routes in the first layer and locations along that route in the second layer. The menu automatically sorts out the images from the chosen route/location. This way visitors can easily get an overview of the routes and locations. And it is easy to get to exactly where you want to go – without the need of knowing exactly what you have to search for! This menu is set up using a tag list with two hierarchical levels in the same list (in one metadata field). But similar menus can be set up using two different metadata fields. 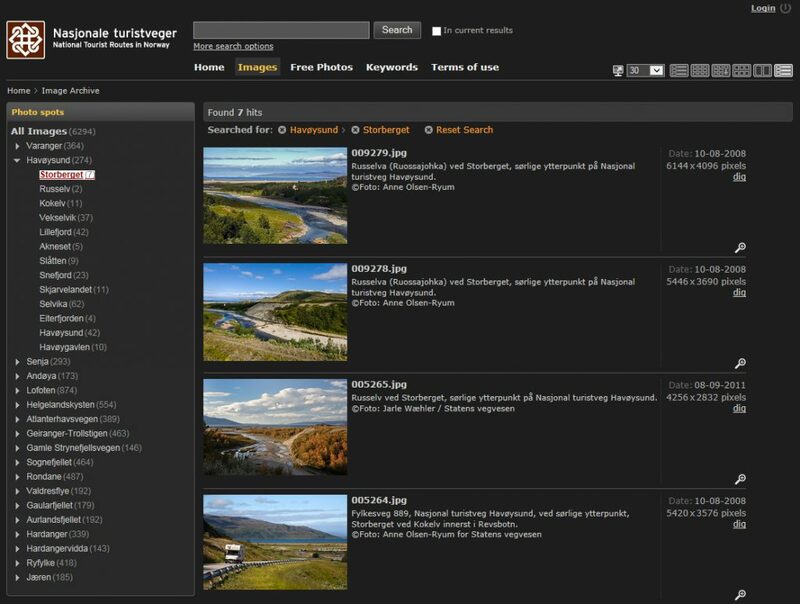 Read more about National Tourist Routes in Norway.’s archive here. Find out more about MediaFiler!